Widely considered the world's most rigorous high school curriculum, the International Baccalaureate (IB) Diploma Programme is at the heart of Annie Wright students' educational experience. Student inquiry, intellectual risk-taking, and international mindedness highlight the school day and ensure our students are well-prepared for college and beyond. All of our students in Grades 11 & 12 take IB courses, and around half elect to pursue the full IB Diploma. According to a study by the University of Chicago, students enrolled in the IB Diploma Programme are 50% more likley to attend a more selective college. What is IB? How does IB work? The International Baccalaureate Diploma Programme, established in 1968 and recognized as the worldwide gold standard of education, provides an academically challenging and balanced program of study to talented and motivated 11th and 12th graders around the world. IB coursework balances subject breadth and depth with a concern for an understanding of the connectedness of disciplines and intentionally fosters international mindedness. Its reputation is based on rigorous external assessments which emphasize the development of the whole student: physically, intellectually, emotionally and ethically. For more information, visit the International Baccalaureate website. International Baccalaureate Diploma candidates are expected to do IB coursework in six major areas, including literature, languages, social studies, the experimental sciences, mathematics and elective of either arts or an additional course from one of the other subject areas. At least three and not more than four subjects are taken at higher level; the others, at standard level. The Diploma Programme has three additional core requirements intended to broaden the educational experience and challenge students to apply what they learn in personally and socially meaningful ways. These requirements include a 4,000-word extended essay on a subject of the student’s choice; a course called Theory of Knowledge (TOK) that examines the nature of knowledge and different ways and kinds of knowing, and a requirement called Creativity, Activity, Service (CAS) which requires 150 hours of personally and socially relevant activity beyond the classroom and, in many cases, beyond the school. IB examinations are taken at the end of the two-year program, and the different exams and assessments are graded by both classroom teachers and external examiners around the world. Annie Wright students may choose to participate in the full Diploma Programme, to earn certificates in individual subject areas, or to focus on completion of the Annie Wright diploma, which continues to be highly regarded by college and university admissions officers. Why do IB at Annie Wright? Annie Wright Upper School believes an IB education and an Annie Wright diploma will prepare graduates to compete and excel in college and, more importantly, in a global society. The mission of International Baccalaureate aligns with and expands the mission statement of Annie Wright School. In particular, IB has translated its mission into a Learner Profile of ten characteristics which inspire and motivate the work of students and teachers. IB learners strive to be inquiring, thoughtful, expressive, knowledgeable, principled, open-minded, caring, balanced, risk-taking and reflective. Participation in IB coursework gives distinct advantage to students in the college admission process. Universities around the globe recognize the rigor and value of an IB education. As evidence, students are asked on the Common Application—the application form used by most students and accepted by most universities in the United States—whether they are IB Diploma candidates, a sign of the value placed on this distinction by US universities. Many universities will also award academic credit for successful examination results in specific subject areas or after completion of the full IB Diploma. Most IB exams occur at the end of the two-year program. What do leading universities have to say about IB? Students seeking the finest [high school] preparation available for an American college should consider the International Baccalaureate. 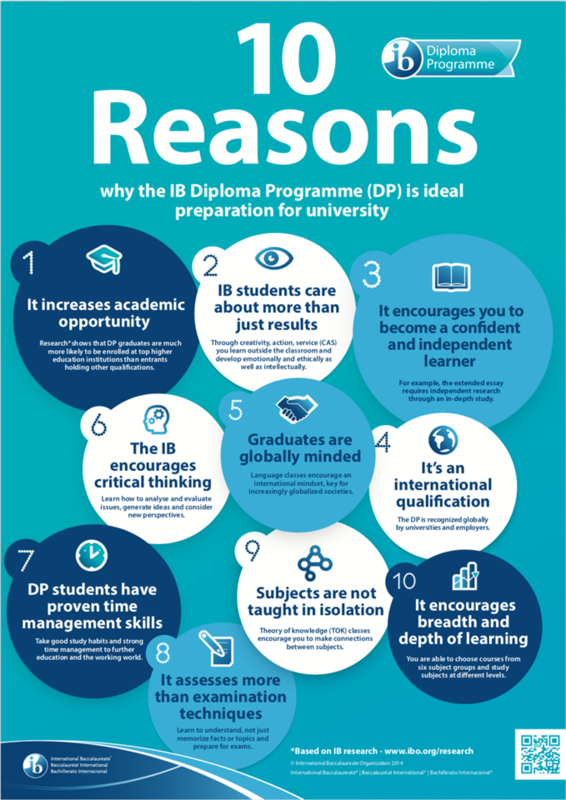 The IB offers an integrated curriculum that provides students with the skill needed to be world-class scholars and an educational philosophy that prepares them to be first-class citizens. I do not know of a more comprehensive and appropriate learning model. IB is well known to us for excellent preparation. Success in an IB programme correlates well with success atHarvard. We are always pleased to see the credentials of the IB Diploma Programme on the transcript. Send us prepared students á la IB... It is the best high school prep curriculum an American school can offer. One of the advantages of an IB curriculum is its structure and quality. It is a coordinated programme, well established, well known and well respected. We know the quality of IB courses, and we think the IB curriculum is terrific. I have always been a supporter of the International Baccalaureate. It is a thoughtful and genuinely intellectual curriculum with an unusually high degree of integrity and connectedness. There is no other curriculum anywhere that does a superior job of both educating students and inspiring a true and broad-based love of learning. The International Baccalaureate Programmes' emphasis on critical thinking skills, increased content knowledge and an interdisciplinary approach to education not only prepare students for success at the postsecondary level, but also for life and the world of work. Who can participate in IB at Annie Wright? All students in Grades 11 and 12 do IB coursework, and around 50% elect to complete the full Diploma Programme. All Annie Wright Upper School students will receive IB recognition on their transcripts.